Wind-up tin lithographs are wonderful examples of the type of collectible toys that clients bring to Mark Lawson Antiques. The most common kinds that we see are automobiles, motorcycles, amusement park rids, popular entertainment characters, and robots. Wind-up mechanical toys have surprisingly uncomplicated inner workings but their form and decoration are incredibly variable. It is this variability and their amusing charm that make tin lithograph toys so desirable and collectible. 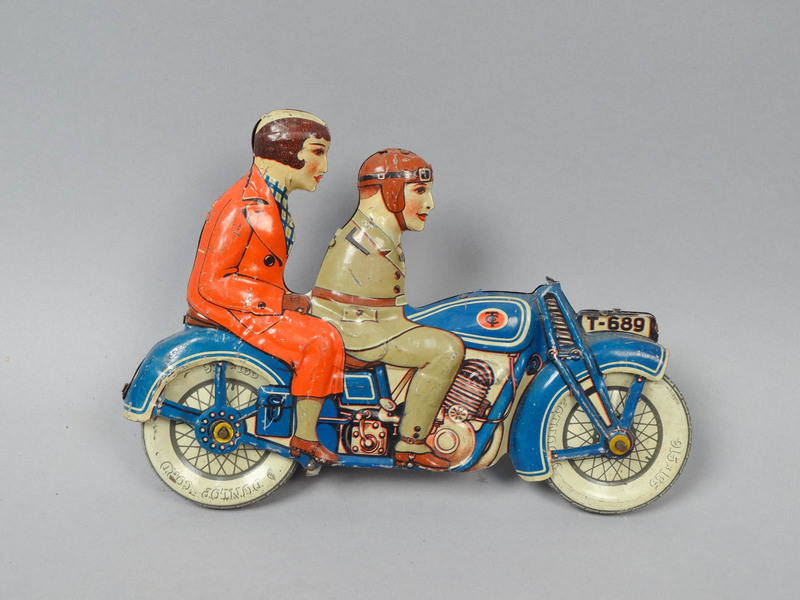 Tin toys were first introduced in the mid-19th century and were decorated in detail by hand. Eventually, the technology developed to the point where offset lithographs were used to print the decorations onto rubber rollers, which was then applied to the tin surface. The colorful, and durable toys were a great deal less expensive to produce and ship than those made from cast iron and wood. 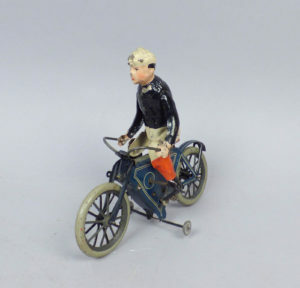 Given this improvement, by the 1920s, manufacturers were able to mass produce the toys for an eager audience. At the turn of the century, Germany led the field in mechanical tin lithograph toy production. France and England also had major manufactures, but were unable to reach the meteoric levels of those in Germany. Across the pond, American companies had a slow start, but, due in part to anti-German sentiment following World War I, eventually became major players in the market. Companies on both sides of the Atlantic advantageously produced toys based on popular characters and celebrities of the day. Newspaper comic strip and movie characters were especially popular inspirations. Walt Disney related toys may be the most prominent example of media influencing the direction of mass toy production. World War II was a turning point for most European tin lithograph companies, as the raw materials were diverted to the war effort. These companies never regained their foothold in the business and Japan eventually surpassed all to become the largest selling country of manufacture. 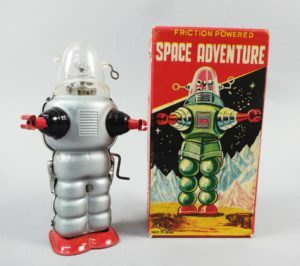 The collectible value for tin litho toys depends on maker, condition, type, and relative rarity. If you have the original box, the value goes up exponentially. 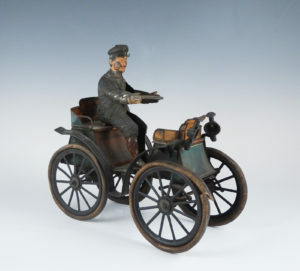 Generally, the hand painted tin toys are very rare and will get premium prices. Wind-up robots will also garner much collectible interest. 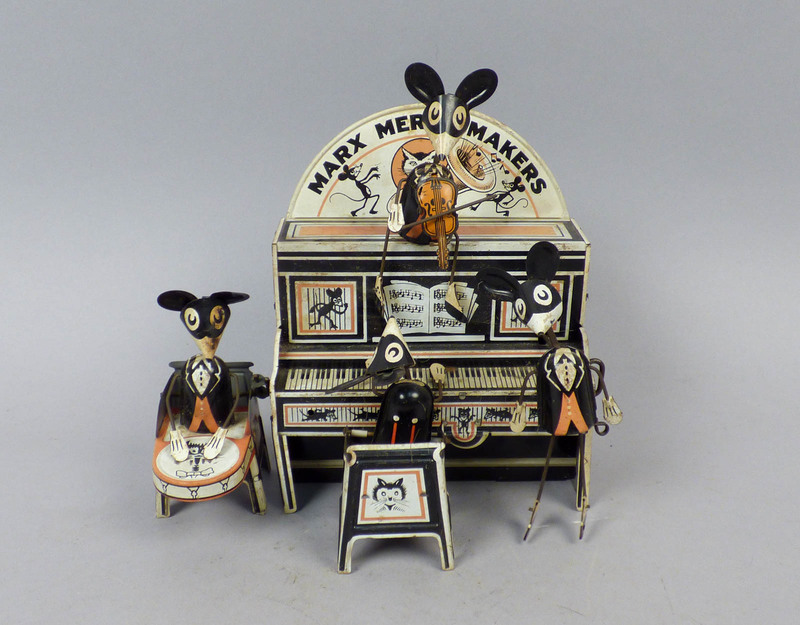 We make no secret of it: we love to see (and play with) tin lithograph toys so feel free to call us at 518-587-8787 or email at marklawsonantiques@gmail.com to set up an appointment today. I appreciate your looking at my treasures, and also appreciate your professionalism and fairness of what you purchased. Look forward to the opportunity of doing business with you in the near future. - Betty T., Burnt Hills, N.Y.